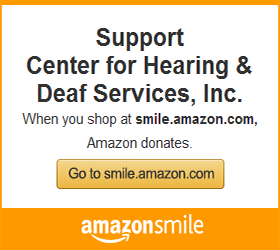 The Center for Hearing & Deaf Services, Inc. (HDS) was established in 1920 as the League for the Hard of Hearing to provide social activities for people with a hearing loss. From those modest beginnings, HDS has evolved into southwestern Pennsylvania’s only comprehensive service center for individuals who are Deaf, Deaf-Blind, Hard of Hearing (HH), or have other communication needs including spoken language interpretation. The Center for Hearing and Deaf Services’ (HDS) mission is to provide a diverse and affordable spectrum of quality diagnostic, rehabilitative, and supportive services to meet the unique challenges of children and adults who are Deaf, Deaf-Blind, Hard of Hearing (HH), or have other communication needs including spoken language interpretation; to provide access to communication in order to increase independence and enhance quality of life for those individuals; and to serve as an information and referral source for those individuals and the general public. HDS does not discriminate in its admission or employment policies on the basis of gender, ethnic origin, age, religion, sexual orientation, or disability. For more than 96 years, HDS has been our region’s sole non-profit provider of programs and services to meet those challenges. We strive to ensure that the programs and services we offer meet the evolving needs of our clients. We retire programs when they no longer meet the need, and conduct regular community, industry, and self-assessments to remain at the forefront of trends, technology, and opportunities that can help us better service our constituents.